Howard Greenberg Gallery and Bryce Wolkowitz Gallery are pleased to present their first exhibitions of work by Canadian photographer Edward Burtynsky. For more than 25 years Burtynsky's work has consistently pushed the boundaries of contemporary photography and social awareness. His large-format color photographs of global industrial landscapes and nature transformed have the capacity to both unsettle and inspire. The exhibition at Howard Greenberg Gallery will be an overview of Burtynsky's vast bodies of work, while Bryce Wolkowitz Gallery will focus on his latest series, Monegros. 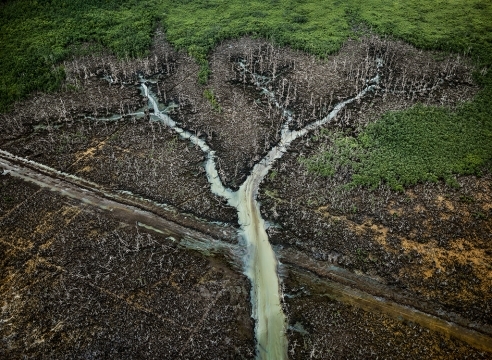 Edward Burtynsky has turned his lens on some of the world's largest industrial operations. His images explore the complex relationship between industry and nature, finding beauty in unlikely places. His range of subject matter has included the oil industry, mining, tire disposal, ship breaking, the railways, and most recently, dry land farming in Northern Spain.